Brock Eastman’s books continue to captivate my attention and leave me glued to the pages. Each time I finish a book in the Quest for Truth series, I am left waiting for the moment when I can pick up where I left off and continue the series. For the 3rd book in the Unleash series, my feelings remain the same and I am completely drawn into the book and memorized by the characters and the story lines. What’s great about Unleash is that it goes deeper into the kid’s characters. I feel that we, the readers, finally get a chance to really relate to the Wikk kids and Obbin. Children go through many growing pains and this story provides us with a chance to see them really grow up. The inner struggles the must face and the various shifts in their personalities are seen constantly. During this book the readers are able to have a firsthand view of what difficulties teenagers face with learning which decisions to make without the guidance of their parents. This book is also, the most spiritual and Christian of all 3 books because it begins to talk about what the Truth is and who is the Creator. I also love how simple the book explains the Father, Son, and Holy Spirit. Brock explains this part of the book like a father explaining it to his younger children. There are so many parts in this book that I could share, but my favorite moment is when one of the twins, Austin, has to fly the ship in place of his brother. I truly feel that this book shows the coming of age for a boy and how their actions affect their future. The sense of adventure in this series is overwhelming at times, but helps prepare you for the kids next moves. The love of family is also a strong theme shared within the book. Overall it is a great read for any family to discuss together. 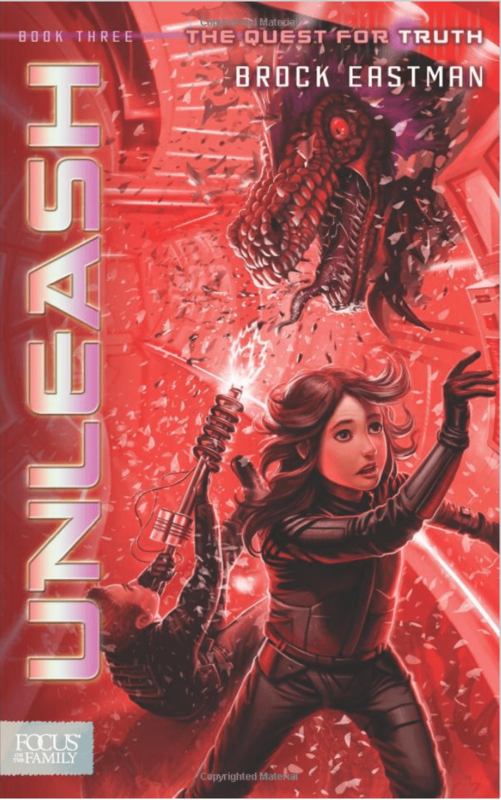 Lastly, Unleash also reveals many deceptions that may surprise the reader so this is another book that readers don’t want to miss. Thank you Brock for giving me this opportunity to again admire your craft and read your books. I highly recommend Unleash for preteens, teens, and adults too. My kids and I can’t wait for the 4th book Tangle. Follow Brock Eastman on Twitter and let him know you are a fan of his books!